Overall New York is very intense. Everyone is in a hurry and usually not helpful at all. Cars and trucks are always tooting their horns even if they can see that the car in front can’t go anywhere. Pedestrians cross anywhere, anytime, and usually wait in the middle of the road. Our hostel was in a bit of a sleazy area on 42nd, 43rd street. Had absolutely no major hassles like being robbed. A few people would say rude stuff but do nothing more. There were lots of people on the street handing out pamphlets. There is also heaps of rubbish on the street and the subway is generally very grotty, but seemed quite efficient. There are a lot of beggars on the subway and they go to every carriage, introduce themselves and tell everyone why they want, or rather need, money. For example, one had a stroke and needed money to survive. Even though I had been to Los Angeles which is also a pretty big city, it didn’t prepare me for New York City. Probably because it is quite different. New York is a lot more concentrated which is why it was full on for me. I actually liked it more for that reason even though it’s hard to tell from my ‘Then’ above. By this time in my travels a few people that had done the States circuit were in New York to spend a bit of time before Christmas and before they headed off home or onto London as I was going to do. Therefore I wasn’t alone in New York and spent most of the time with someone while sightseeing. I had never been so cold in all my life. Luckily I’d bought a fairly warm winter coat when I was in Florida, of all places, but I also wore tights under my jeans and bought a hat to keep my head warm. It was bitter, especially as I was traipsing up tall buildings to view the city, and I climbed the Statue of Liberty. I couldn’t get over the cars beeping at each other when obviously nobody could move. It seemed everyone was in a hurry in this place. Coming from a city of about 1 million people it’s a big culture shock, although New York is the only city I’ve ever been to where there is this constant beeping. I could hear it in the room I was staying in. As I mention above I stayed on 42nd, 43rd streets not far from the Port Authority Bus Station – not a very good area. The hostel I stayed in was at the top of a 13 or so storey building and there was a brothel on one of the floors so you never knew who you’d be in the lift with. 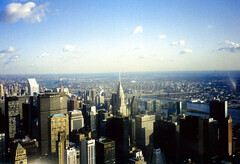 Two of the photos I’ve put on a Flickr set of New York have the twin towers showing prominently. It’s a stark reminder whenever I see them that these buildings are no longer there.